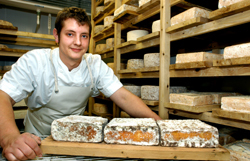 An interview with Martin Gott; farmer and cheese-maker of the fabulous St James cheese! Find out what Martin loves on the food scene, his ethos for his business and his recommendations on the best places to eat and shop for food! After working for my dad in the early days of Borough Market I learnt to make cheese with Mrs Kirkham’s, then Mary Holbrook, and then for myself. I now make St James and have done for 10 years. What made you get into doing what you do? I was inspired after selling cheese with my father on his market stalls, I made my first experimental batch of cheese alongside James Aldridge when he visited my fathers farm in the hope of inspiring him to make cheese. I was about 14, my dad never did go on to make cheese, but it inspired me. To make cheese that inspires people, that’s unique, that encourages people to think about where their food comes from and who it’s made by. Flavour is important. Nicola (Martin’s wife) starts the milking around 6.30am leaving me to get the kids up and ready for school. We have a swap round when Nicola takes the kids to school and I start the cheesemaking. We usually break for lunch around 12.30 by which time the curds are in the moulds and Nicola has turned out the sheep and sorted the other animals. The rest of the day is about packing, turning and washing cheeses. The cheese needs almost constant attention until around 4pm so one of us takes care of this, while the other works on the rest of the work needed to keep the farm ticking. We pick the kids up at around 3 and then work till whatever jobs need doing that day are done, this could by anytime from 4pm till midnight depending on the time of year and what’s going on on the farm. We milk and make cheese 7 days a week from February till October so it’s our life during the season and everything fits around that. In the winter it’s about doing what needs to be done and getting some time off from the dairy. We still have a lot of animals to feed and look after so it’s not quite a holiday, but the pressures definitely off. For me it’s living and working in he countryside, cheese-making allows us to work the land and manage our animals on a small but still profitable scale. Hearing positive feedback from customers and fans of the cheese is always nice, knowing our cheese is out there making people happy makes me happy! 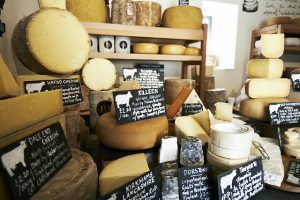 I love to see a full store full of nice cheeses but I love to see it empty at the end of each season knowing the cheese has been sold and enjoyed. Each year the first and last days of the season are still the most exciting, for totally different reasons. We eat a lot of our own lamb, pork and the occasional deer I can get my hands on. My eldest Dan is going through a curry phase at the moment though so that’s taken over for now, but if we have guests they usually get served some sort of Venison Pie! What is your favourite place to go eat? We’re lucky to have Simon Rogan on our doorstep so if it’s a really (really) special occasion we tend to eat at L’ enclume or Rogan and Co in Cartmel. Otherwise it’s one of the good local pubs round the lakes. We also sell our male lambs as milk fed lamb to restaurants at this time of year, they taste amazing! I’ll always have a soft spot for Mrs Kirkham’s and Mary Holbrook’s cheeses like Cardo and Old Ford. These cheeses got me into cheese-making and I can’t eat them without thinking about the great people that make them. Good ale is hard to beat. I like deep red wines which don’t tend to pair well with cheese, so for me ale and cheese is the answer. Knee press sinks? if I ran the country all sinks would be knee operated! We won the James Aldridge Memorial award from the SCA In our first year it was an amazing privilege then and I still look back and feel proud of that today. Seeing St James sold to school children in Italy that were eating it like it was chocolate has to be up there too! More of the same hopefully, I’d love it if when they’re ready my children Dan and Zara get involved with the business too but I suppose I won’t blame them if they want to work in paid employment either! At 9 and 7 years old they’re a long way off making that decision yet though. 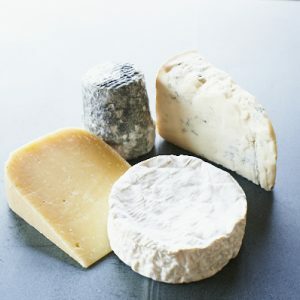 Find Cartmel Cheeses online at: http://www.cartmelcheeses.co.uk.